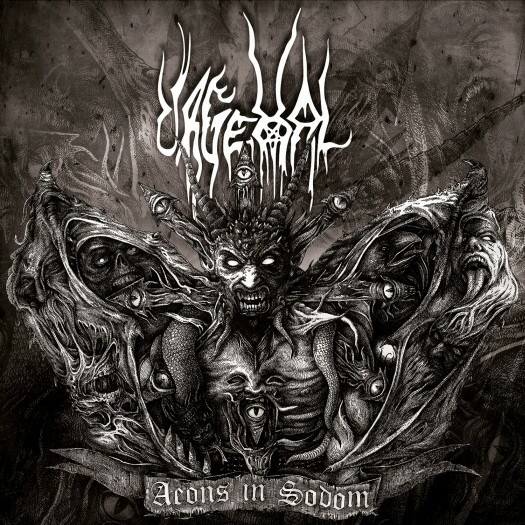 Metal Bandcamp proudly presents our first ever full album premiere, featuring the new, and final, Urgehal album Aeons in Sodom, which will be released February 12 on the Season of Mist Bandcamp. Urgehal, one of the most consistently well-reviewed long running bands on Metal Archives, were struck by tragedy in 2012 when band leader Trondr Nefas passed away. Now the band has collected his final material into one last album, one last savage blast to honor his memory. The press-release reads: "Nefas' masochistic screams are too unique to replace, so the band have enlisted the services of venerable Scandinavian metal scene icons to contribute vocals. Featuring the unique vocals and personas of Nocturno Culto (Darkthrone), Nattefrost (Carpathian Forest), Nag (Tjusder), Niklas Kvarforth (Shining), Hoest (Taake), Mannevond (Koldbrann) and more"
Aeons in Sodom is full of ripping black/thrash riffs and slithering solos (always an Urgehal specialty); combined with the veritable smorgasbord of black metal vocalists it is a fitting testament to Trondr Nefas' legacy and also a monument to the origins of Norwegian Black Metal.